Bulgari Serpenti Incantati Tourbillon Lumière. The source of inspiration for the watch speaks to the brand’s roots as a fine jeweler – a vintage brooch made by Bulgari in the 1930s. It is combined here with the company’s other growing strength, high watchmaking. 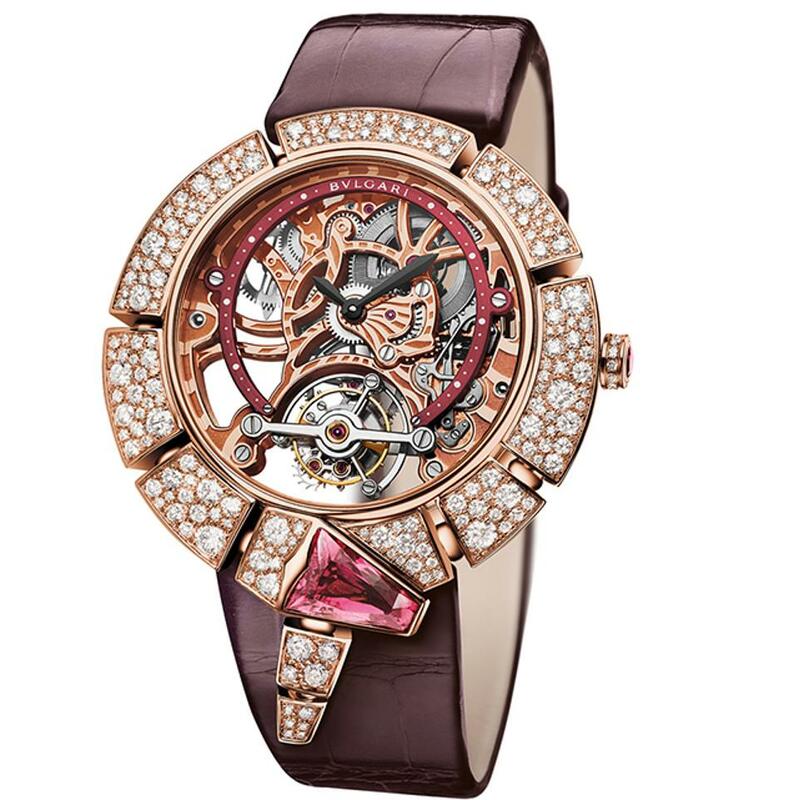 In a fashion statement unique to the watch world, the color of the tourbillon bridge is matched to the jeweled serpent’s head, which is made of rubellite. A pusher at two o’clock on the case rotates overlapping dial plates slightly to reveal either numerals or the secret phrase “He loves me passionately.” The case is “champagne-set,” with diamonds set close together on the lower dial and then more spaced out toward 12 o’clock in a simulation of champagne bubbles rising in a glass. Bees and butterflies indicate hours and minutes. Girard-Perregaux’s iconic tourbillon with gold bridge looks better in this ladies’ watch than it ever did in a men’s. The beauty is in the subtlety of the decoration, which never detracts from the tourbillon escapement, a symbol of high watchmaking. 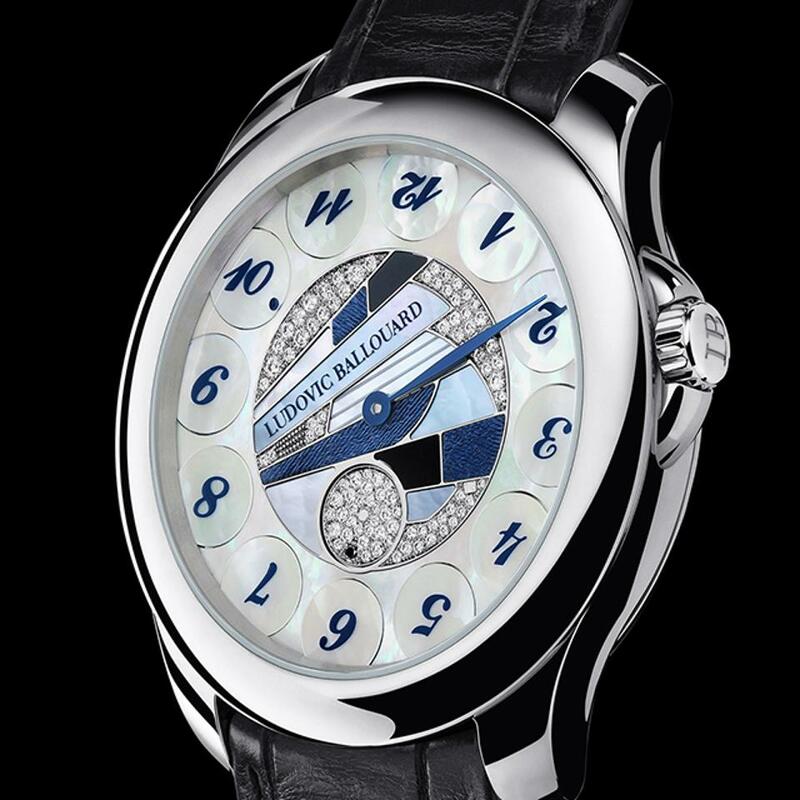 The bridge is engraved with a scrolling pattern, which is repeated in the mother-of-pearl dial that surrounds it. Vuitton’s monogram flower is nicely interpreted in a mother-of-pearl cameo-style sculpture surrounded by diamonds. In a decorative interpretation of the mechanical watchmaking function, hours are indicated by a mechanism that rotates a diamond-set cube at each hour on the dial. The cube is turned to reveal a side set with black diamonds rather than white ones, indicating the current hour. This watch similarly marks hours in an unconventional way. The numerals are all upside down except for the current hour, and in case you miss it, a black dot appears beside the right-side-up hour. Technically, this is a complex version of the jump hour movement, a traditional complication that shows the hour in a window, much like a date display. 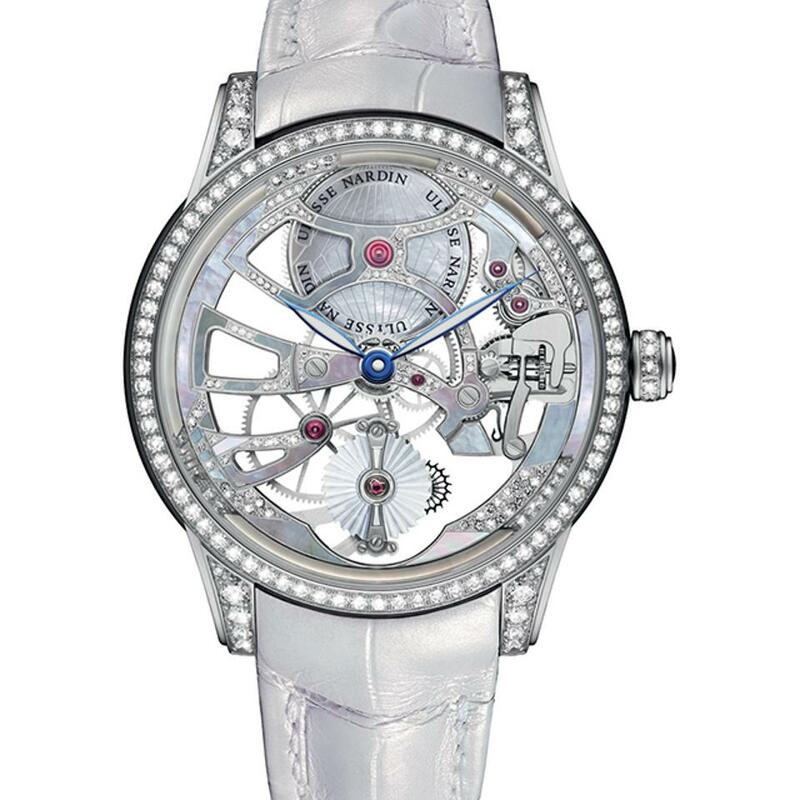 This utterly unique interpretation of a skeletonized watch for ladies combines randomly set diamonds with mother-of-pearl inlay on the bridges, for a look that is subtly feminine while highlighting the traditional art of skeletonization. 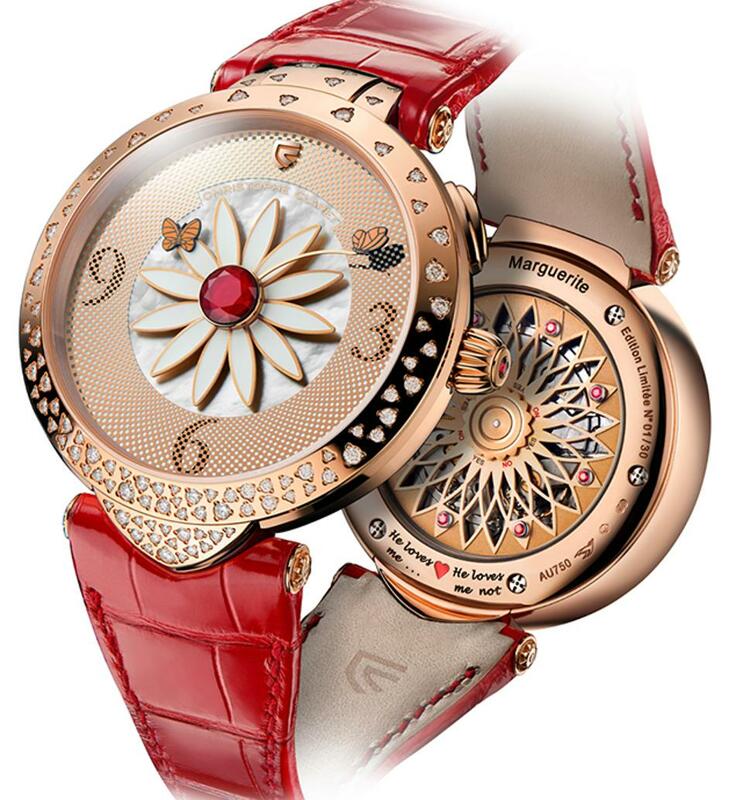 It contains the skeletonized Tourbillon Caliber UN-170, with rubies on the bridges to reduce friction. 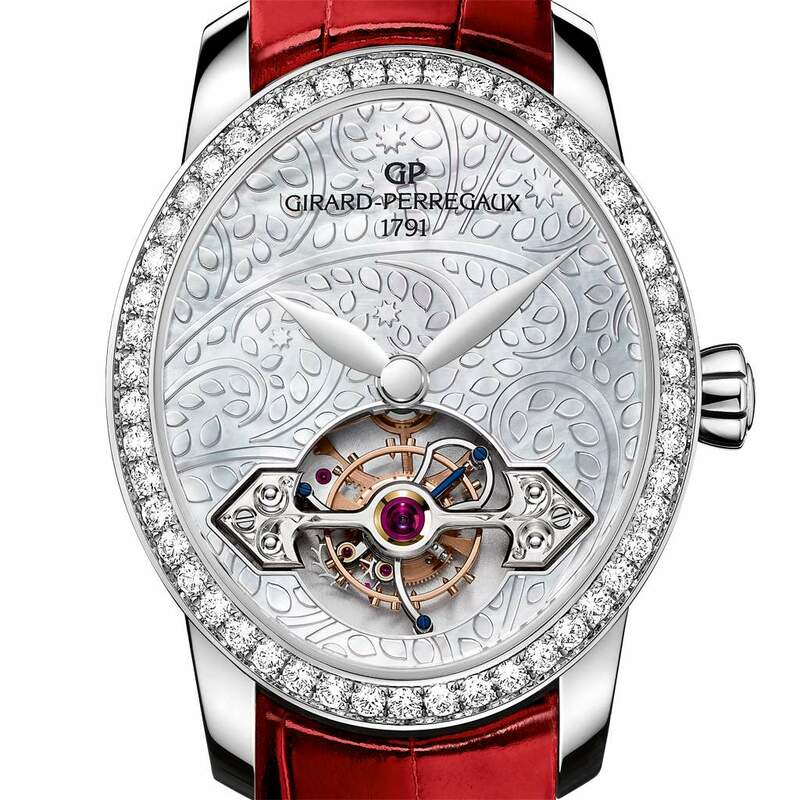 The mother-of-pearl inlay at 12 o’clock covers the mainspring barrel, and the tourbillon cage at 6 o’clock is decorated with mother-of-pearl sculpted into a shell shape. The case is made of grey gold. These are all great watches, but to me, the Ulysse Nardin is the winner. It marries high craftsmanship and high watchmaking in a way that is at its most minimalist. 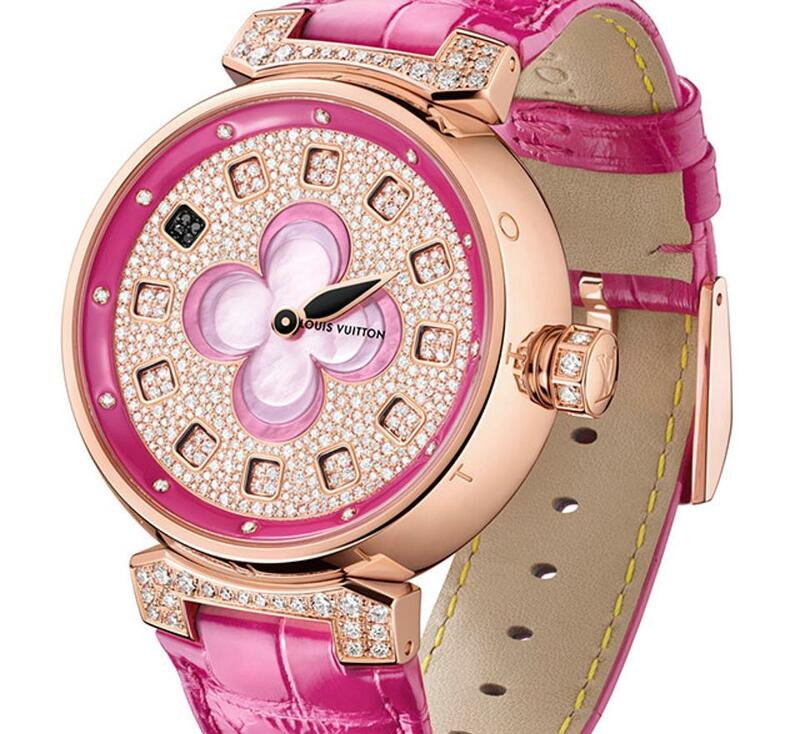 This is a watch made for an adult woman, with no flowers, bees or butterflies to announce its status as a girl’s piece. It contains a first-rate mechanical complication and moderate, well-crafted decoration. Perfect. Check back on November 10 to see how close I came to picking the winner.